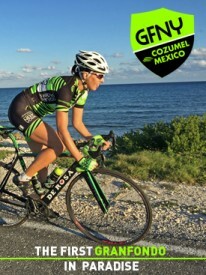 New York City, November 20, 2014 – The inaugural GFNY Cozumel will be held on the Mexican tropical island of Cozumel in the Caribbean Sea on November 23, 2014. The race attracts a sold-out field of 1,000 riders from all over the world. Athletes will enjoy fully closed roads and spectacular views of the Carribean Sea. GFNY Cozumel brings challenges that are unique to the sport of granfondo and are no less daunting than the steep climbs and tricky descents of some other granfondo events. Although the course is flat, riders will need to overcome the relentless tropical sun and the constant Caribbean trade winds. GFNY Cozumel will be raced over two distances: the 100mi / 160km “long route” and the 50mi / 80km “medium route”. All riders are chip-timed and prizes will be awarded to the race winners overall and in age groups. Next stop on the GFNY World tour will be GFNY Puerto Rico on February 15, 2015. The 5th annual Campagnolo Gran Fondo New York on May 17, 2015 will also be the GFNY Championship. The race features the world’s most international peloton with riders from over 70 countries and 48 US states. Athletes will take on a challenging 100-mile route from NYC to Bear Mountain and back to compete against each other, the clock and themselves in a personal endurance challenge. The 50-mile GFNY BEAR on the same day is a non-competitive ride from NYC to Bear Mountain. New for the 2014-2015 season, GFNY WORLD features events in Italy, Mexico, Puerto Rico, Colombia, Spain and France. Campagnolo Gran Fondo New York raises funds for Operation Smile, the international children’s medical charity. The official Grand Fondo New York website is: www.granfondony.com.